We are located in the historical district/old town of Ohrid, (50 meters to center fountain, close to shopping, a few minutes to the lake in quiet zone with terrace view, TV) which is UNESCO world heritage. We can meet you anywhere in town if you will just call us and let us know where you are. 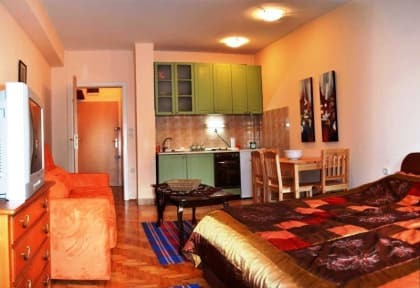 AnastasiaHomestay is located in old town close by church St. Bogorodica-Kamensko (30 m. left-opposite site to the church. Any taxi can take you there, just tell him to drive to our street. We offer you: hot showers 24 hours, tax included in the price, free coffee and tea anytime, fully equipped kitchen and dining room, washing machine (laundry service). 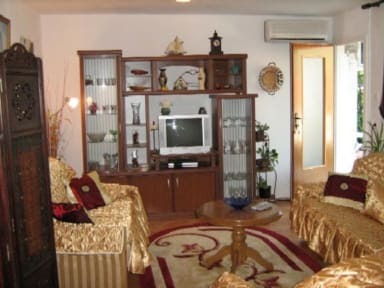 We have a very flexible check in and check out procedure, prospects and information about Ohrid with free computer presentation for our monastery, churches, frescous, mosaics, castle, antique theatre, sightseeing and all Ohrid's surroundings, a free city map for every guest and we are within walking distance from ATMs. Also if you are interested we can organized daily tours only for your points of interest for the surroundings on our behalf will cost you cheaper than if you do it on your own. We are at your disposal at any time. You desire and we fulfill your wishes, according to your needs, with us, your dreams become reality. Finally if you let us know when you are coming, we will meet you at the bus station or anywhere in our town areas and we will return you to the property together.